Yes, after much delay, many excuses, internet connection issues, uncooperative Alaskan weather, a hosed up PayPal account, and a broken nail, I am finally ready. Thanks for being (mostly) patient. OK, this is the first time I've sold my stuff over the internet, so there may be a few bugs. Apologies in advance. As I noted previously, I'm a bit leery of doing things this way. I'm quite confident in my abilities and the quality of the bowls, however I think there's a huge difference between looking at a couple of pictures on a computer screen and holding the actual piece in your hand, especially if you've shelled out your hard earned moola for it. So, I've tried to make as much info available to you as possible, and if you do decide to purchase one of my pieces I hope you enjoy it and consider it worth the price you paid. 1) I've listed the pieces I currently have available below. Each piece is numbered and linked to a hi-res Flickr picture gallery. Prices are listed, along with shipping and handling. 2) If you're interested in a piece, so note in the comments section below, refer to the piece you're interested in by it's number. First come, first served - I don't like doing it that way, because I think it's a bit unfair to anybody who doesn't check my site every ten minutes, but I don't want to do the bidding thing, and I can't think of a better way to do it at the moment. So, whoever posts first, gets the piece. You may call dibs on one bowl. After 24 hours, you may call dibs on another one, if it's still available. I will confirm your selection in a follow up comment. Note: Some of you have previewed my Flickr gallery and sort of staked out your claims. That's OK, and I'd ask everybody to be respectful of other's who have expressed interest in a particular piece. However, and again, first come gets first dibs. 2a) If you really want something, and somebody beats you to it, so note in the comments section. Try not to be all whiny about it, loser. I'll make you a another, similar piece. Note: you see how fast I get things done, so figure it'll be at least two weeks before I can complete your request. Just saying. And no, you do not have to pay me in advance - if I get it done and you decide not to buy it, I can always sell it locally, I've got more buyers than I've got pieces (yeah, tourist season is coming up). 3) There's two methods of payment, the quick and easy get-your-artwork-before-you-know-it email method, and the slow and painful mail-me-a-check-and-wait-method. Your choice. The email method works like this, once I've confirmed your selection in the comments thread, you'll email me and I'll reply with a PayPal enabled email. You'll be able to then connect to the secure PayPal site and pay either by using your own PayPal account or by credit card. You may also mail me a check or money order. I'll provide you with my mailing address if you choose this method. 4) The bowls: Because I work in green heartwood, all of the bowls may change shape slightly depending ambient temperature and humidity. The hollowforms should hold their shape fairly well, but the straight sided, shallow walled designs will become slightly oval, some more than slightly, depending on the wood and a number of other factors - I consider this a feature, not a bug. These pieces are made from living, organic materials and if you want something that is, and remains, perfectly geometric - these are probably not for you. Additionally, each piece will contain small checks (cracks running across the grain), these are naturally occurring imperfections, caused by flex (wind and felling) damage to the tree and by drying wood. The cracks and checks have been sealed and will not get any larger or weaken the bowl. Again, I consider these features, not defects, and they add to the character of the piece. Description: Green turned Alaskan birch heartwood. Hollowform design. 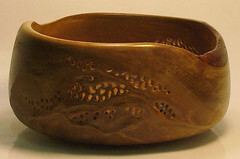 The sides are relief sculpted to emphasize the complex heartwood grain pattern, and then filigreed along the grain lines. 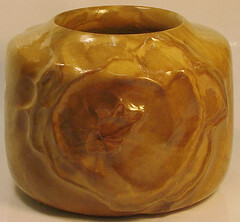 In strong overhead light, the filigree and grain patterns suggest swirling white water. This is a display piece and not intended for practical use. It is finished in tung oil and a tough glossy acrylic that should last for many years. Description: Green turned Alaskan birch heartwood. Hollowform design. Some slight sculpting and filigree which emphasizes the wood's natural grain patterns. This is a display piece and not intended for practical use. There a two checks on the interior surface, both are sealed and stable. It is finished in tung oil and a tough glossy acrylic. Description: Green turned Alaskan birch heartwood. Hollowform design. 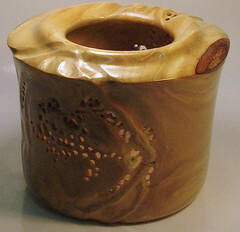 The sides are deeply relief sculpted to emphasis the extensive heartwood grain pattern. The walls are thicker than I usually make them, in order to support the deep sculpting. As a result this piece is heavier than it would appear, it has plenty of heft and is not very delicate. This is a display piece and not intended for practical use, though due to it's weight, would make a good vase for dried flowers or such. It is finished in tung oil and a tough glossy acrylic. Description: Green turned Alaskan birch heartwood. 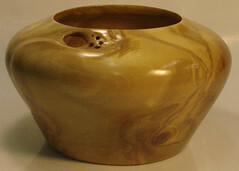 The sides are relief sculpted to emphasis the extensive heartwood grain pattern. Complex filigree swirls around the bowl. This is a display piece and not intended for practical use. It is finished in tung oil and a tough glossy acrylic. Note: I love this piece. The pictures don't do it justice. Under strong, white light it is simply amazing. Description: Green turned Alaskan birch heartwood. 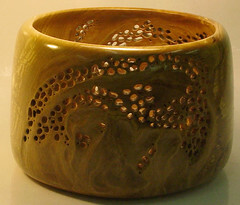 This piece was made from wood harvested near Big Lake, Alaska. The tree was damaged in the 1998 Houston/Big Lake fire, and portions of the bowl rim and sides reflect this damage. There is also some slight spalting and other very interesting features. 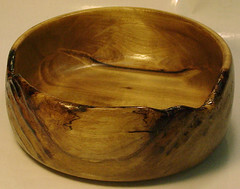 The simple shallow bowl design is intended to emphasis the unique beauty of this wood. The sides are very slightly relief sculpted to emphasis the grain pattern. It is finished in Danish and walnut oils and a tough glossy acrylic. Description: Green turned Alaskan birch heartwood. This piece was made from wood harvested in South Central, Alaska. This is a large piece and the heartwood grain patterns resemble the magnetic field lines in solar flare pictures, at least they do to me. The sides are relief sculpted to emphasis the warm yellow grain patterns, which contrast sharply with the darker sapwood. It is finished in Danish and walnut oils and a tough glossy acrylic. Description: Green turned Alaskan birch heartwood. This piece was made from wood harvested in South Central, Alaska. 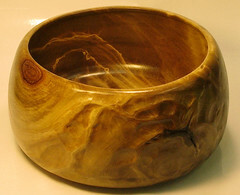 This is natural edge bowl, in others words the rim is shaped by the curve of the original log. 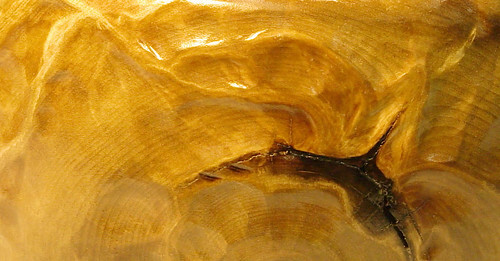 There is a strip of smooth bark wood along a portion of the rim. The sides are relief sculpted, and then filigreed. It is finished in Danish and walnut oils and a tough glossy acrylic. That's it for the moment. I will have some additional pieces available later this week. Now that I've got a process established it'll be a whole lot easier. About once a month, I will post what I have available. Doc, done, on both accounts. #43 is yours. And I will make you a second one, similar to it. Email me at jlwright@gci.net, be sure to include "Birch Bowl" in the subject line. And I will reply within two days with the paypal info. Jim - can I put in a claim on #48? I have a friend who used to spend time in Big Lake, and I think she'd love the bowl. Tania, I will reserve #48 for you. I think Shawn Powers asked about this one. Shawn I have another piece of wood similar to this one, and if you're interested I'll make you one. Crap... Tania beat me to it. :) The missus really likes #48 too. Do you still have any wood harvested from the fire? I don't mind waiting. I'm actually glad Tania go the claim in early though, because the actual location of the source has no meaning to me. Shawn, no problem, I have a piece that's perfect for you, cut from the same wood. I'll finish it and get pictures up for you. And I just spoke with Donna, the idea of you making a bowl for us specifically from the get go is a pretty cool notion. I'm still on for Number 44, which I pre-reserved, and will bid tomorrow for my next choice (46), which is not posted yet on this thread. I'm trying to abide by your 24 hour rule, though, so if someone else wants 46, then I'll custom order it for an Xmas gift with no heartburn. Janiece, no problem. 44 is yours. And I'll get the other pieces up tomorrow along with one you haven't seen yet. Jim, I think I posted on the other comment thread by mistake. If #45 is still available, I'd very much like to have it. I'll e-mail you just in case. God, I love #45. However, Tom has already spoken for it. (#50 is a close second, and Kate spoke for it in the other thread. It seems fair to honor that, since it was specific, not rambling like I was doing.) Thankfully, I am a patient person and trust that Jim can make magic happen a second time and produce a sibling for #45. I'm putting in a custom request via email. Nice to see this is working for you Jim. Save me a blank. I want to work on one or more while there. nice job putting it all together. GO STONEKETTLE!!!! Hey Jim - I like # 48, which of course is already sold because I'm slug slow. I would love it if you could make another similar for me when you have the right piece of wood. In general - I like art that uses the imperfection of the materials to create something far more beautiful than something symmetrical and blandly perfect could ever be. Is that too pretentious? I'm up in Anchorage almost every month, even occasionally out in our Wasilla office, so I'd be glad to buy it from you in person. My email is jeri at ungeekit dot com. Oh - and Big Lake fire damaged wood has meaning for me too... we used to spend a lot of time on the lake when we lived up there, and the fire damage was so stark and sad.